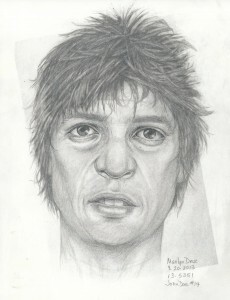 The Department of Medical Examiner-Coroner is seeking the public’s help with the identification of an unidentified male. On July 31, 2013 at approximately 11:00 A.M., human skeletal remains were found along the Rio Hondo Riverbed bike path near Lincoln Avenue and San Gabriel Boulevard in Montebello, CA. The remains were determined to be a White or Hispanic male with an age range between 35 and 55 years of age. He has a partial denture at the back of his lower right jaw. No wallet or other identifying papers were found with him or in the surrounding area. There’s two sketches included with the press release. This is the one that’s most telling. Know who it is? Call the LA County Coroner at 323-343-0714. Police identified a man who was shot sunday as Oscar Torres, 38, of Bassett. Torres was shot and killed in the 2200 block of Mardel Avenue early Sunday morning, officials said. Coroner’s officials said Torres was shot in the head, the torso, the hand and leg. A man with him was wounded in the shooting. BASSETT – A man was killed and another wounded early Sunday in a shooting in an equestrian neighborhood, authorities said. The incident was reported about 6:30 a.m. in the 2200 block of Mardel Avenue in an unincorporated county area near Industry, Los Angeles County sheriff’s Sgt. James Beamon said. The dead man was identified only as a Latino man in his 30s, Lt. Dan Rosenberg of the sheriff’s Homicide Bureau said. His name had not been released late Sunday pending notification of family members, coroner’s officials said. No motive or shooter information was known Sunday afternoon, according to Rosenberg. “At this point, we’re talking to witnesses and trying to determine what happened,” he said. Deputies from the sheriff’s Industry station were initially sent to investigate a report of a shooting, Rosenberg said. “They found a male Hispanic adult suffering from gunshot wounds deceased in the front yard,” Rosenberg said.